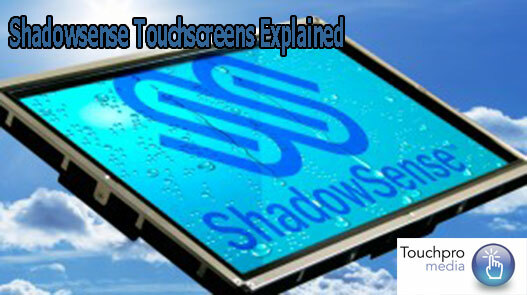 Different Types of Touchscreen Technologies : Shadowsense Explained – We hire Touchscreens, Video Walls, IT Equipment & more to Exhibitions Throughout the UK and Western Europe. All touchscreens are not the same. They achieve the same thing; you place your finger or stylus on the screen and your finger or stylus acts like a cursor or mouse pointer, but there are several different types and they achieve this by using different builds and technologies. There are also pros / cons – advantages and disadvantages to each type. But now there is a new kid in town and he goes by the name of Shadowsense. But this isn’t a new superhero – but a new touchscreen technology developed by a Canadian Company called Baanto. From their website however, they do have a offices in the UK, both in Berkshire and Cambridge. Now I have to make clear that I have never used a Shadowsense Touchscreen and cannot vouch for its accuracy, reliability etc and I am only going by what I have seen on the Baanto website. However, if this new way of doing touch is to be believed , then it may be the way forward. The technology relies on certain pixels being half occluded/covered. Then when a stylus or finger etc moves about the screen the half covered pixel can “judge” the positioning on the finger or stylus and give a more precise positioning of its location. Another advantage of this technology is that because its input is tied into the motion of the the stylus or finger as it moves about, it can ignore the misleading inputs of dust and dirt present on the screen. This is a major advantage. Anyone who uses touchscreens regularly will know that screens, even in the cleanest of environments are prone to gathering dirt or dust from either the environment tor users and can then become inaccurate, until they have been cleaned. These also provide true multi-touch. If we ever get our hands on one we will report further.